A Short History of the Construction and Opening of St Mary’s Catholic Church. In February 1848, a parcel of land of 2 acres with frontage to Turallo Terrace between Ellendon and Butmaroo streets was dedicated to “Roman Catholic Church purposes” by government grant according to the practice of the time. The foundation stone of St Mary’s was laid on 25 May 1851 but building did not begin immediately. A report in the Goulburn Herald of 13 April 1861, some 10 years later, stated that “the Roman Catholic chapel at Bungendore is progressing”. The delay in building the church may well have been linked to the Victorian Gold rush that commenced in earnest in 1851 and continued for most of the 1850s resulting in many local folks leaving town and making the long trek to Ballarat and Bendigo. 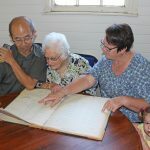 The parish registers held in the Queanbeyan church records a marriage in the Bungendore Catholic school room (St Mary’s hall) on 21 February 1859. This establishes a date for completion of the school room as 1858 and suggests that the church was not yet open. 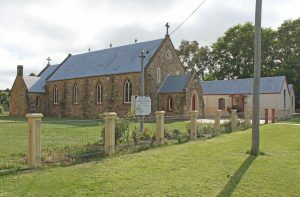 A marriage is recorded at John Dwyer’s residence in Bungendore on 7 April 1861 – also suggesting that the construction of the church had not been completed. The Benedictine Journals record on Sunday 20 July 1862 about 70 people were ‘confirmed’ by the Archbishop. Was it in the hall or the just completed church? We do not know for certain however is has been assumed that the event was held in the newly completed St Mary’s church hence the selection of 1862 as our year of opening. The first marriage recorded in St Mary’s church Bungendore was 22 October 1863 – so we know for certain that it was open by that date. The sign attached to the post in the front of the church grounds states that St Mary’s was opened in 1862 based on research done by Fr Brian Maher when he was the parish priest in the 1980s. As it is unlikely that a precise date of opening will ever be established, one of the feast days of St Mary’s will be chosen as the date of opening for commemorative purposes. Anniversaries such as this are not only about land and buildings – they are a time to remember all those – past and present – who, over the past 150 years who have strived to build and preserve the faith community which is St Mary’s. The foresight of those early legislators who allocated land to each church in the towns that sprung up over the colony of NSW – and yes, we should also remember that that land belonged to aboriginal peoples and nations that existed for at least the 40 thousand years before European settlement. The clergy and religious who ministered to the parishioners of St Mary’s for over 150 years including: Archbishop Polding who conducted the confirmation service here on 20 July 1862, Frs Brennan and Therry and other priests whose contributions are listed in Fr Brian Maher’s book “Chords from the Harp”. St Mary McKillop first visited Bungendore and the school children in the hall in April 1899. Fr Birch who on retirement after many years as Parish Priest built his home next door – Birch house. Through to more recent times i.e the restoration of the churches during Fr Maher’s time, Fr Ron Flack and the much loved Sister Margaret whose image is in the rose garden outside the church house and Fr Troy who is leading us through a period of significant change in the church. We should remember too, all those over the years who have willingly accepted leadership positions in the various ministries that strive to keep our faith community strong – and who continue to do so today. I was going to mention the names Darmody, Reardon, Fogarty, Sillis, Velnaar, Montesin, McCullagh but I decided against for fear of leaving out some key names. We should also remember those who left this faith community during WWI and WWII and who did not return. If you attended the Memorial Day service here in Bungendore on 11 Nov you would have heard one of the school children telling the story of Tom Daniels uncle – one of two members of the Daniel family who left for the 2nd WW and never returned. Time does not permit detailing the efforts of all those who have contributed over the years so I will leave you to remember in your own way those who are special to you. Some of you will recall completed the National Church Life Survey about 12 months ago. The results have just been released and it is interesting to note that the main reason for church attendance appears to be a sense of belonging to a faith community while a sense of believing came a close second. The Parish Pastoral Council has had as its focus efforts to build our faith community here at St Mary’s so join us for morning tea after Mass and say g’day to someone new.